If you have a pooch that loves going for walks but loves pulling on their leash even more, it can really make you dread taking your pup for a walk. Luckily, there are a variety of solutions available. How to use a dog harness? How does a dog harness work? 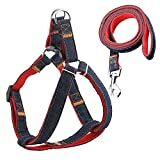 How to adjust dog harness? 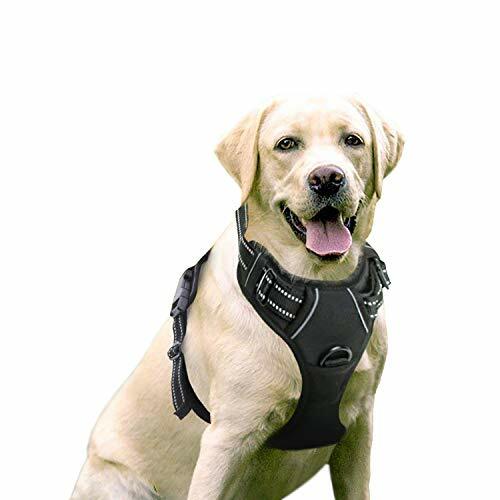 If you are looking for a harness that can be used for running, walking, hiking, playing, and hunting, then this durable harness may be just what you are looking for. When placing a harness on your dog, there are so many things that can easily get in the way, particularly if you have a pup that doesn’t like to be restrained. Luckily, this harness by RABBITGOO takes away any worries you may have. It is easy to put on and remove, allowing you to avoid any chaos that may ensue. This harness makes sure that any pressure from pulling is evenly distributed over your pup’s chest and shoulders, ensuring no choking or injuries can happen. This harness is made using resistant material that is durable and strong. It also has a lot of padding in the chest region. The two leash attachment points are made from durable metal, with one located on the chest and the other on the back. These points can be used with any leash. They are made from very resilient materials that are known for their long-lasting properties. Additionally, the seams are very robust and sturdy. This harness has a simple design that makes it easy to put on and take off for hassle-free wearing. It comes with 2 metal leash attachment points on the back and chest. Plus, the harness distributes your pup’s pulling force evenly over his body to stop choking and pulling. The sizing chart runs smaller than stated, so you will have to order one size up. Some users also complained that this harness is not ideal for large dogs that pull very hard. This harness has been constructed from a denim material that is heavy-duty but chafe-free. It is a great choice for walking, training, and running. Plus, it comes with a matching leash. 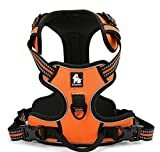 If you are looking for a reliable and sturdy harness that can withstand even the toughest of dogs, this one has you covered. It is made from very durable materials and also features a high-quality plastic buckle. The metal D-rings are excellent for securing your pooch conveniently, safely, and quickly in the harness. The clasp is made from stainless steel, which indicates just how robust this product is. On the inside of the harness, you will find PVC cotton padding which reduces the amount of tugging and pulling your dog will do. But when they do, they will be comfortable without the risk of choking or injury. 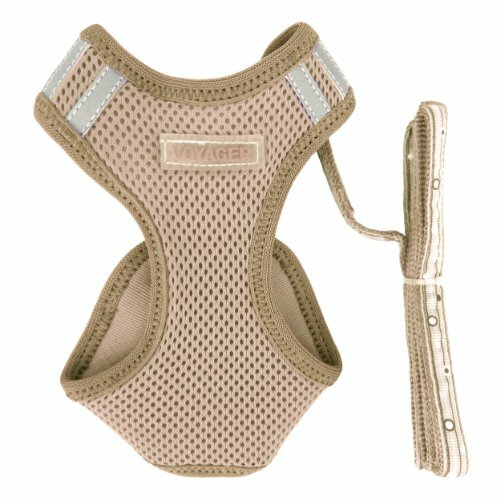 This harness is adjustable, allowing you to find a custom fit that is perfect for your pooch. It also has an anti-twist feature, so you do not have to worry about your pup getting tangled up. This high-quality harness comes with a 4 ft. long matching leash, giving you a complete dog walking solution. It has two points of adjustment so you can perfectly fit it to your dog. There are also 2 metal D-rings to secure your dog safely. If you have a very powerful dog that incessantly pulls and tugs when on a harness, you may find that they can break through this harness. It has also been reported that the plastic adjusters are easy to chew through if your pup can reach them. This harness is highly effective at stopping your pup from pulling and tugging when walking thanks to the front attachment point that lets you steer your pup sideways, thus reducing or eliminating pulling. This PetSafe harness is ideal for ensuring that both you and your beloved pup can enjoy a stress-free walking or running experience without any pulling or tugging. It has a special front attachment that automatically steers your pooch towards you, reducing the degree at which they pull on the leash. The well-positioned chest strap promises that your dog is always comfortable and will not choke or suffer any neck injuries. The belly strap is a different color to the chest strap so that you can easily tell the different straps apart. The harness has four different points of adjustment so you can get a custom fit that is reliable and supportive at all times. The harness comes along with a handy guide that shows you the proper way to adjust each strap to attain the best fit possible. This harness is ideal for flat-faced dog breeds, such as Boston Terriers and pugs who need their necks to be protected from pressure. This harness also has robust, adjustable straps that help to evenly distribute your dog’s pulling pressure over their shoulders, belly, and chest. The sizing of these harnesses runs a bit bigger, so you will have to order one size smaller than stated. Some users also claimed that the harness fitted their dog awkwardly and that they could not adjust it to fit properly. This harness is soft and very reflective for added visibility. It has breathable, fast-drying material and neoprene lining. Plus, it has adjustable straps with parachute clips that snap to close. It can be quite tough to take a large dog for a walk, especially if you are not a large person. This is mainly because large dogs are often stronger than they look. The EXPAWLORER harness is an excellent no-pull option for large breeds that you need solid control over. This harness has a reflective strap which makes it really easy to locate your dog while also making drivers and pedestrians aware of your pup. The nylon handle is an excellent addition, especially if you have a Houdini hound who doesn’t like staying in their harness or an older pooch that needs assistance into your car or over rocks. It is also helpful when training your pup. The EXPAWLORER harness also has a sturdy metal D-ring which you can easily attach your leash to in just second. The harness is also padded for additional comfort. The adjustable straps also make it really easy to get a secure, snug fit for your pooch. This harness is padded, making it a great option for breeds with deep chests, such as Boxers and German Shepherds. The adjustable straps allow you to get a good fit, while the heavy-duty metal D-ring gives you a sturdy point of attachment. Plus, it has a reflective strap for added visibility in low-light settings. The sizes of this harness run slightly larger than stated, so you need to order a size down or adjust it to be much tighter. It can’t be used for puppies or small dogs, and there is no chest attachment point. This harness is made from durable, breathable mesh materials, so it is the best all-weather harness for your pooch. The step-in design lets you get your dog walk ready in just a few seconds – forget struggling with collars and leashes forever. This harness is durable and robust, especially when you consider its very reasonable price. It has two strong metal D-rings that are sturdy and heavy duty for stability. The Velcro closure adds another layer of safety and security throughout the harness. The Velcro and straps ensure that your pup will not chafe. This harness has been made focusing heavily on safety features. The two D-rings, additional padding, and extra-strong buckle are paired with very reflective 3M piping, ensuring that your pooch is easy to see when out in lower light conditions. You can purchase this harness in four sizes from XS to large. It is also available in 15 different color choices that are all beautiful, including red, blue, pink, and black. The sturdy Velcro closure and reliable D-rings allow you to securely keep your pup in the harness, even if he is known to escape. The harness is made from very breathable materials, making it ideal for any weather conditions. The size chart for this harness is inaccurate, with the sizes all being smaller than described, so it is best to order a size up. It has also been reported that the plastic buckle is easy to chew through if your pooch can reach it. If you are looking for the best harness for your pooch, but you are unsure of where to start, this guide should help clear things up. We have looked at the most important features needed for the best harness that you need to keep in mind when purchasing a harness. Many dogs pull and tug when they are walked on collars. This poses not only a choking hazard, but can also cause injuries to your pup’s neck and throat. When considering a harness, look for models that evenly distribute your pup’s pulling weight across their shoulders and chest. 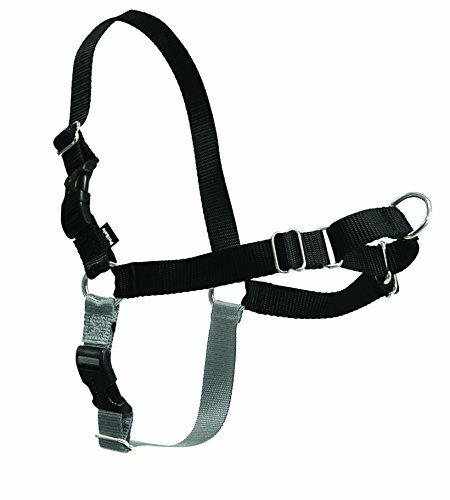 Moreover, look for a harness that has multiple attachment points, particularly one on the chest. Chest attachment points discourage your dog from pulling as it will simply turn them around. A standard dog harness comes with three things: a chest strap or pad, a strap that goes between the front legs, and straps that go over the shoulders. Some over-head harnesses have a solid piece of material without straps for the chest and neck, but they all work in a similar way. Sadly, cars aren’t made to safely transport your pup, which means you need to add that safety if your pooch rides in the car with you. Look for a harness that has 3 restraint points that can make use of the car’s seatbelts and anchors. In the same way that you would buckle your child in, your fur-baby needs the same restraint. While padding isn’t considered the most important safety feature, it is one of the most important comfort features, making it cozier to wear the harness while also protecting your pup’s fur and skin from pinching, pulling, and damage. 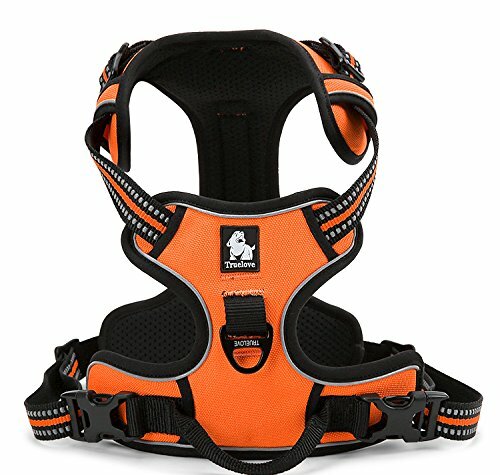 Some harnesses feature full padding while some only have padding on the straps or chest. We recommend that you choose a harness with as much padding as possible, especially in the chest and shoulder area, as this is where most of the pressure is applied. Unpadded harnesses have a tendency to chafe and rub, and should be avoided. Look for fleece or neoprene padding. When walking with your dog, you want to make sure that they are always visible to motorists and pedestrians, especially in lower light conditions. Luckily, most harnesses on the market have reflective strips, patches, stitching, or straps that improve your pup’s visibility. If you find a harness that you love that doesn’t have any reflective features, it is best to either sew some reflective strips onto the harness or attach a clip-on LED light so that your pooch is always kept safe. Harnesses are available in all sorts of sizes and shapes, and thankfully most of them are very adjustable. This feature allows you to fine-tune the harness to get a custom fit that is perfect for your pup. Most harness will have at least 2 points of adjustment, but the more you have, the better, as this means you can really tweak it to perfection. Dog harnesses are very simple to use and are also a lot safer for your pup’s neck. Once you have put your dog’s harness on, you can normally choose between attaching the leash at their back or chest. How you use a dog harness depends on the type of personality your dog has and what your goal is, e.g. training, stopping pulling, slow walking, etc. Attaching the leash at the back will allow the harness to function much like a collar. This attachment point is ideal for slower walkers and older dogs. Attaching the leash to the chest attachment is best for dogs that pull and tug as its position prevents your pulling pooch from effectively doing so. It is also a great attachment point for training. A dog harness works by keeping your pooch at your side when walking rather than in front of you, dragging you along. This places pressure on your dog’s neck and throat which could lead to injuries. When attached at the chest, your dog is unable to pull as he will simply turn themself around. Once you have put the harness on your pup, it is important that you correctly adjust it so that it is comfortable, secure, and snug. Start at the back straps and tighten each side equally until you can fit only 2 fingers between your pooch and the harness, and then do the same for the shoulder straps. Finding the right harness for your pooch can be a tricky task if you are not sure what to look for. The above buyer’s guide will help you find just what you are looking for. 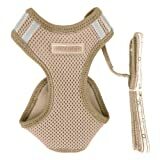 Plus, all of the harnesses we have listed are excellent choices for your beloved canine. Our favorite is the Best Pet Supplies Voyager Harness which has been made from breathable, durable mesh fabric, making it an all-weather harness. The step-in design lets you get your pup walk-ready very quickly. The easy-to-use buckle and two metal D-rings are heavy-duty and can tolerate tugging and pulling. This robust harness is available in XS to XL sizes, and can be adjusted to customize it for your dog’s size and build.